Only a small fraction of the many visitors to Yosemite Valley make the 2 hour drive along the Tioga Road through the center of the park, and the majority of those stop only at roadside overlooks, without hiking along some of the many trails in this region, which lead to beautiful glacial lakes, to mountain peaks and along tree-lined canyons. 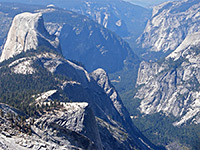 The scenery is different to the low elevation western section of the park as the land is less wooded and has much more exposed rock, allowing for grander views - without any single feature as dramatic as the main valley although this can still be seen, from above, by hiking several miles south, for example to the summit of Clouds Rest. 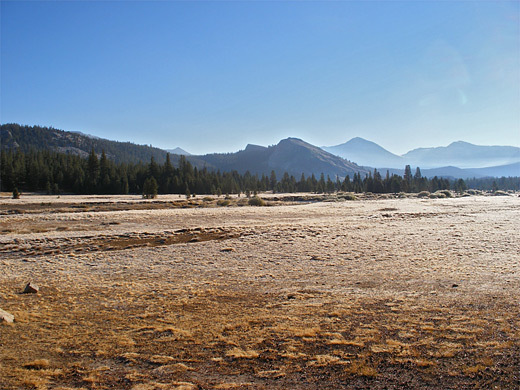 Interesting sites are spread out all along the Tioga Road, though this has only one focal point, at Tuolumne Meadows, a 2 mile long expanse of grassland (largest in the Sierra Nevada range), beside which are various visitor facilities and trailheads. 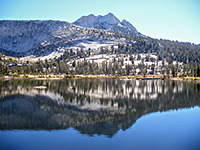 Besides giving access to the Yosemite high country, the Tioga Road (CA 120) is important as a trans-Sierra highway and provides the only route over the mountains for 200 miles, between CA 108 from Sonora to Bridgeport, and CA 178 from Bakersfield to US 395, far to the south at the edge of the Mojave Desert. Like highway 178 and several other nearby routes, the Tioga Road is open for less than half of the year, usually between the start of June and mid November, owing to the huge amounts of snowfall, accumulating to depths of 20 feet or more. Within the park, 30 of the road's 46 miles are over 8,000 feet, reaching a high point of 9,945 feet at the Tioga Pass, Yosemite's east entrance. Some snow persists on the tallest mountains all year, and nights are always cool even in summer, though for several months the days are usually very pleasant, with highs in the 70s and brilliant blue skies overhead. The Tioga Road closed for the season on November 20th, 2018, and will reopen in May or June 2019. The highway begins in the west at a junction with the Big Oak Flat Road near Crane Flat, site of a campground and gas station. 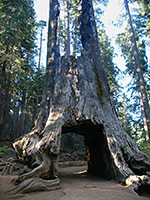 Also nearby is one of the three sequoia forests in the park, the Merced Grove, a quieter and less-visited alternative to the main grove at Mariposa. The Tioga Road soon passes close to the third sequoia group at Tuolumne Grove, which contains about 25 mature trees and is reached by a one mile walk downhill along an old paved track, now closed to vehicles. Past here, the main highway climbs steadily but unspectacularly for several miles, through thickly wooded hills without any exposed granite. At 8,000 feet a side track leads to the first of five campgrounds along the road, at White Wolf, which also has a lodge, restaurant and log cabins, and is the starting point for long distance hikes into the Grand Canyon of the Tuolumne River. Shortly after is another, longer side road to the Yosemite Creek campsite, the smallest (40 sites) and the least busy. Continuing east, the scenery becomes more impressive as the land opens out to reveal many granite peaks, cliffs and domes. The road makes a big curve around the upper end of the Yosemite Creek drainage, passes another campground at Porcupine Flat and approaches close to 10,850 foot Mt Hoffmann, one of the most accessible summits in the park. Nearby are several trailheads including the easy route to May Lake. The next few miles are the most dramatic, as the road crosses a granite slope to Olmstead Point, an overlook of the deep canyon of Tenaya Creek and beyond to the upper end of Yosemite Valley. Serene Tenaya Lake comes into view one mile further - this is the largest lake in the southern 2/3 of the park and has an especially attractive setting next to a group of smooth, streaked granite domes and jagged peaks (see panorama). 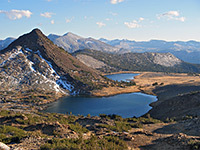 The Tioga Road runs right next to the shore for a couple of miles, past may places for picnics, paddling and short walks. 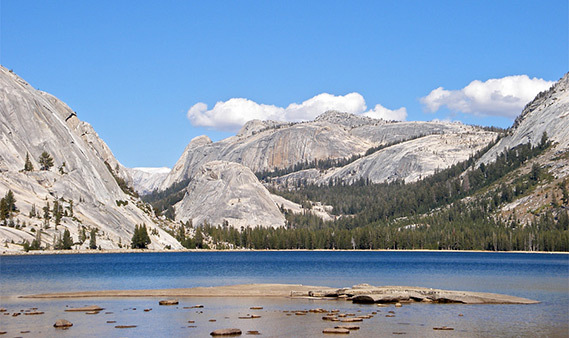 At the west end of Tenaya Lake is a walk-in campsite, and several nearby paths to places such as the Sunrise Lakes, Clouds Rest, Polly Dome Lakes and even Yosemite Valley (16 miles away). 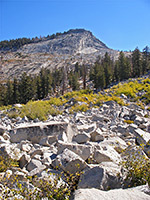 After Tenaya Lake, the Tioga Road follows a ravine between steep sided Polly Dome and Pywiack Dome, through thick woods for a while then descends to the edge of Tuolumne Meadows, where the woods open out and flat, flower-filled grasslands stretch into the distance, bordered by the high mountains of the eastern Sierra. Services at the meadows are grouped together, 2 miles further, and comprise a gas station, campground, ranger station, visitor center, wilderness center, and several shops, lodges & restaurants. Many facilities close around late September, a month or more before the actual road is shut. 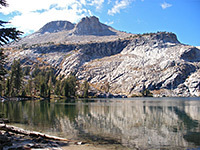 The most popular trails along the Tioga Road begin near here (see map and listings), principally the routes to Dog Lake/Lembert Dome, Elizabeth Lake, the Cathedral Lakes and Glen Aulin/Tuolumne Falls. Lembert and ten other domes are popular rock climbing locations, offering a variety of short and medium routes. 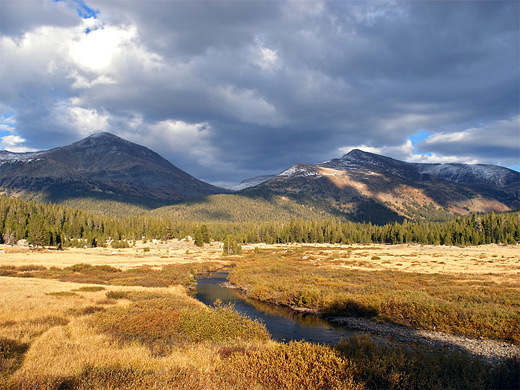 From May to mid September the NPS operate a shuttle service between the meadows, Olmstead Point and the Tioga Pass, stopping at all major trailheads and several other places. More meadows are found a little further east around Dana Fork of the Tuolumne River, though now the surroundings are rather different; gone are the granite domes and wooded slopes, instead the land rises to high, barren, snow-capped mountains, forming the east crest of the Sierra Nevada and marking the edge of the Great Basin Desert that stretches all across Nevada into Utah. The main path in this section of the park is the John Muir Trail, which links Yosemite Valley with Tuolumne Meadows then turns back south down Lyell Canyon (a good location for spotting black bears) and eventually enters the Ansel Adams Wilderness. The road reaches the national park boundary at Tioga Pass (9,945 feet, the highest pass in the Sierra range) then begins a long descent into Mono Basin and a junction with US 395 at Lee Vining. Two good, less-traveled trails begin near the boundary, to Mono Pass and the Gaylor Lakes/Great Sierra Mine, both giving an excellent perspective of the more rugged high elevation scenery in this part of the park. On the far side of the pass are two pretty lakes (Tioga and Ellery), several expensive NFS campsites, and the Tioga Lodge offering accommodation and dining. Although this is now national forest land, free camping is not permitted - the nearest place for that is along side roads around the south edge of Mono Lake, 13 miles from the pass and 3,500 feet lower.